There are a few foods that are often served in southern restaurants outside the south. Shrimp and grits are one, and fried green tomatoes are another. 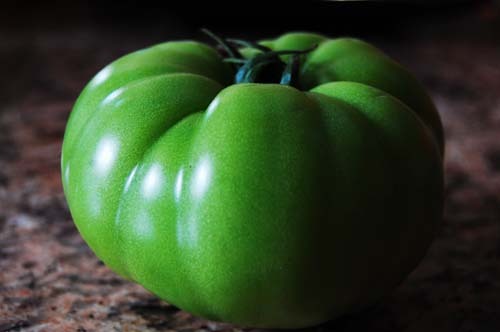 I love fried green tomatoes, and love that they are championing southern culture with each crunchy delicious bite. I was lucky enough to find green tomatoes at the farmer’s market so this weekend I made a delicious fried green tomato salad. 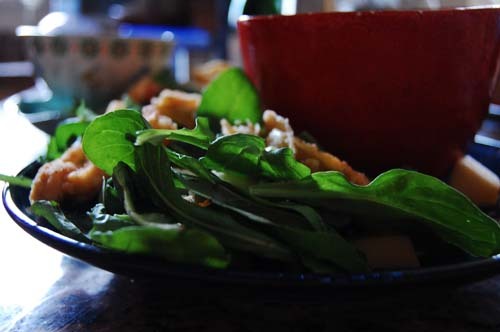 I used arugula, fresh whole basil leaves, fresh mozzarella, and apples. I sliced the tomato into half moon size pieces so that they were bite sized. Dan sliced the mozzarella into strips and used his new apple corer/slicer to cube an apple. It was fresh, delicious, and totally fulfilling. The perfect start to a lovely dinner. Thinly slice the mozzarella. Cube the apple. Toss arugula, basil, mozzarella, apple, and fried green tomato. Top with the dressing of your choice. Slice the tomato in 1/4″ slices, and then half them so they’re in half moon shaped pieces. Mix paprika, cayenne pepper, half the red pepper, and flour. In a separate bowl, mix cornstarch, the remaining red pepper, garlic powder, and salt & pepper. Finally, in a third bowl crack the eggs and whisk them together. Dip each piece of tomato first into the flour mixture, then into the egg, and finally into the cornstarch mixture. To test if the oil is ready, stick the handle of a wooden spoon into the oil. If bubbles form around it, you’re good to go. Fry the tomatoes for two minutes on each side. 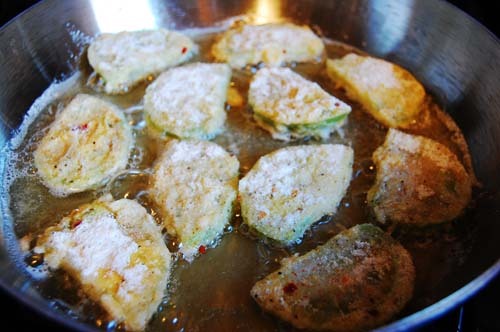 After they’re crispy and golden brown, place them on a paper towel to let the oil blot off.